To read Webster Groves, Part I, click here. And Part III can be found here. In July, I visited Webster Groves (a St. Louis suburb) and had a good time driving around and looking for kit homes. Friend and fellow researcher Rachel Shoemaker knew I was headed to the St. Louis area and did a little reconnoitering for me. It was Rachel that found this GVT #535 (also known as The Roberts) in Webster Groves, sitting - literally - right next to the railroad tracks! 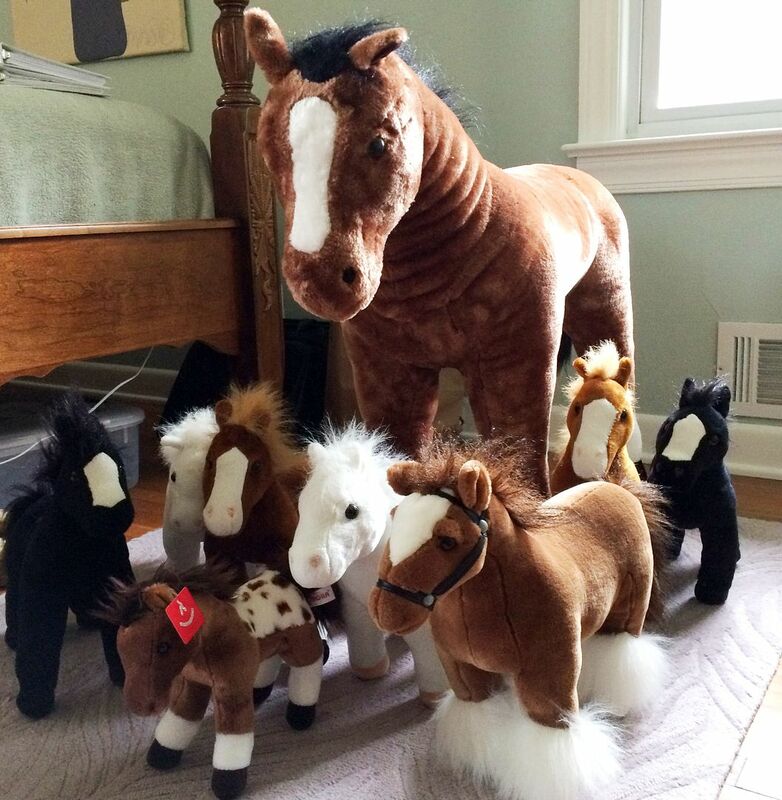 One of the questions I'm often asked is, "How do you find kit homes?" Railroad tracks are a good place to start! Because these houses came in 12,000-piece kits and were shipped by rail (in a single boxcar), they usually landed within 1-2 miles or rail lines. The Gordon Van Tine landed right next to the train tracks! If you look at this century-old map, you can see just how close Model #535 (with red star) sat to the Missouri Pacific Railway (yellow line)! 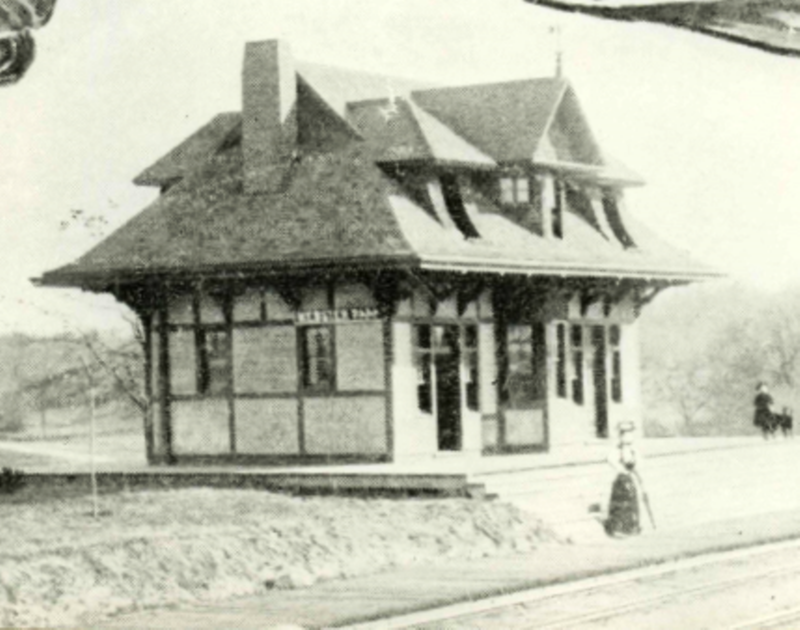 Built in 1892 by the Missouri Pacific Railway, this story-and-a-half commuter station was on the corner of Oakwood and Glen Road. It would have been a short hop (as in, less than 200 yards) from the Gordon Van Tine #535 to this darling little train station. The Gordon Van Tine #535 was featured on the cover of the 1916 catalog. The Gordon Van Tine "Roberts" was hugely popular for this Iowa-based kit home company. 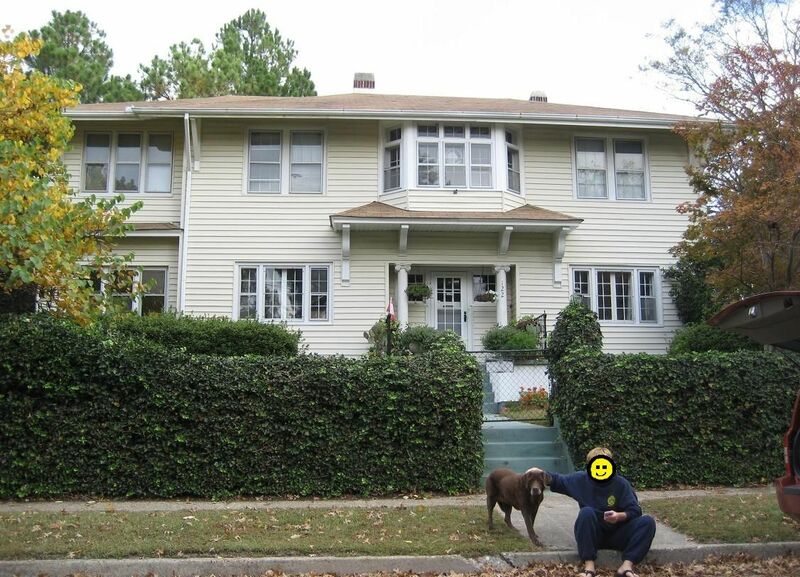 The inset porch, 2nd-floor bay and hipped roof all work together to make this an easy house to identify. 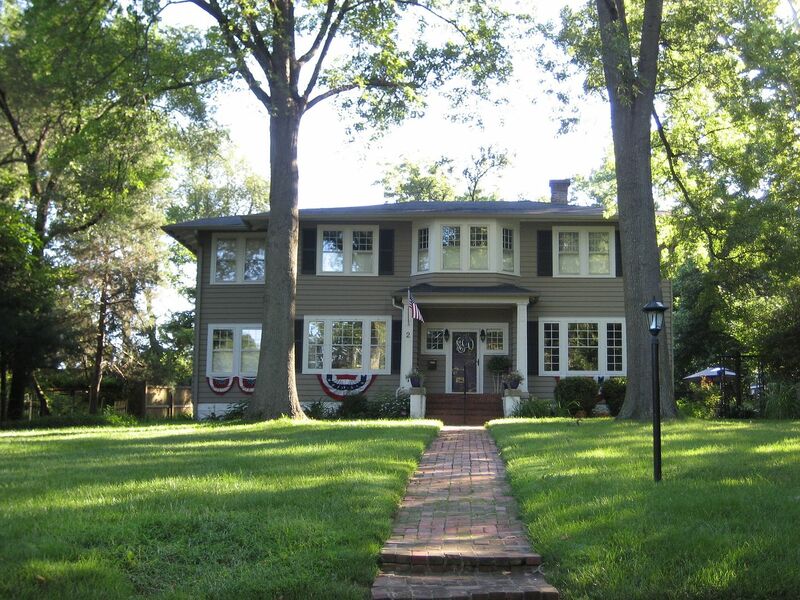 That, with this home's location (right on the tracks) made it mighty easy to find in Webster Groves. Plus, it was probably one of Gordon Van Tine's most popular homes! What a beauty! And it's all dressed up for July 4th! 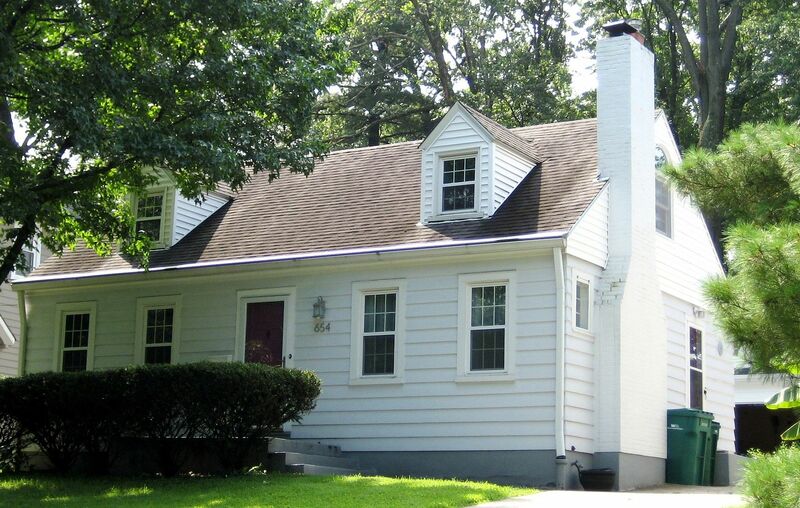 Thanks so much to Rachel Shoemaker for finding this house in Webster Groves. 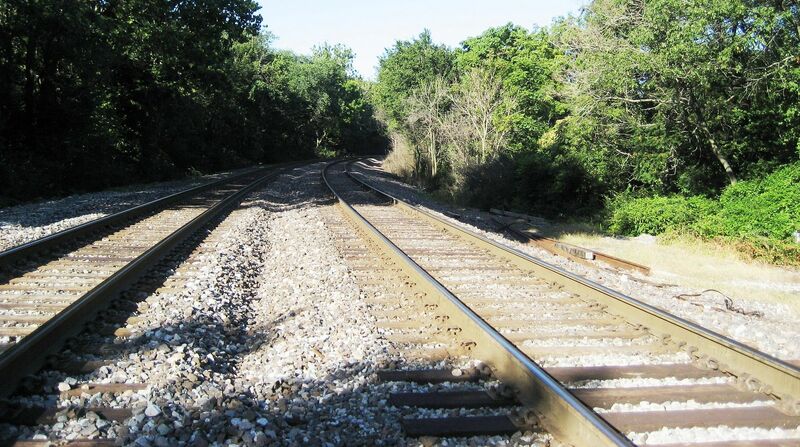 When I talked to her about this discovery, she told me, "I always start my searches next to the railroad tracks. I found this house within seconds!!" And here's a Gordon Van Tine "Roberts" that I found in Front Royal, Virginia. Dale Wolicki found this "Roberts" in State College, Pennsylvania. 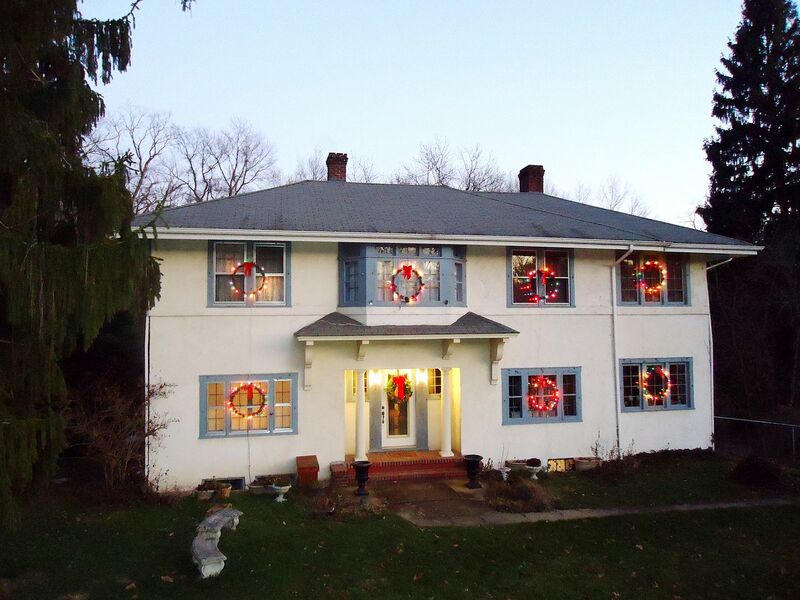 Another beautiful "Roberts" in Wheeling, West Virginia, and it's all dressed up for Christmas! Photo is copyright 2012 Frank Harrar and may not be used or reproduced without written permission. Last but never least, a "Roberts" in Charleston, WV (sans two-story porches). Thanks again to Rachel for finding that Gordon Van Tine #535! You can visit Rachel’s website by clicking here. Learn more about Gordon Van Tine by visiting Dale’s website here. Rebecca Hunter has an abundance of information on kit homes here. What do Webster Groves, Missouri and Grand Haven, Michigan have in common? 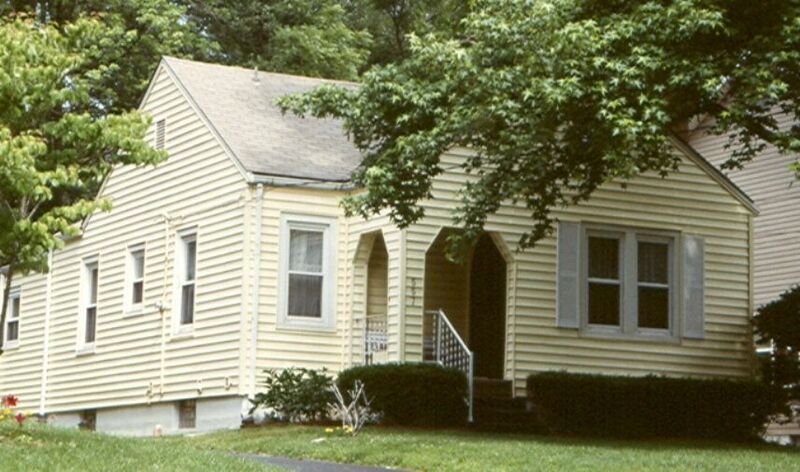 While I’d love to take credit for finding the “Cape Cod” in Missouri, it was Webster Groves resident Judith Chabot that found this house by searching grantee records. Here’s how it works: When an existing house is conveyed to the new homeowner, the new homeowner is the grantee, but when the homeowner conveys the house back to the bank (as security for a mortgage), the homeowner is then the grantor. 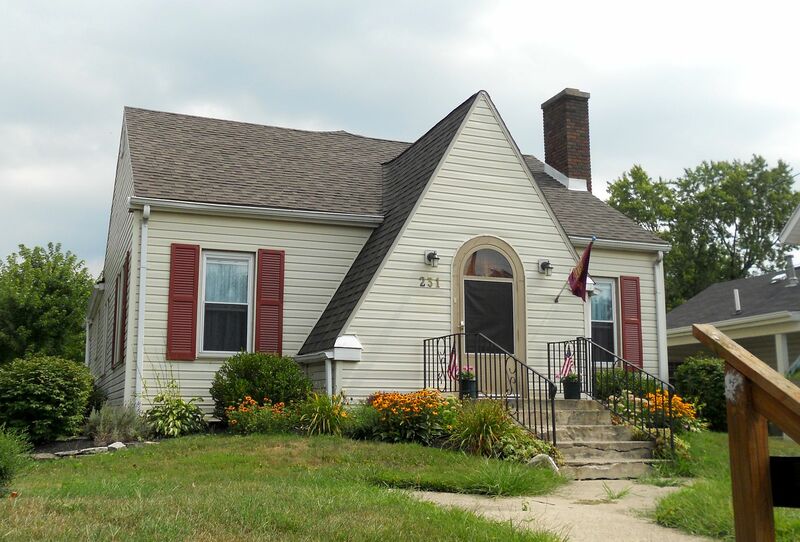 The mortgage company receiving the interest in the house is the grantee. So if you’re looking for a Sears House at the courthouse, you’re going to be looking through the grantee records, but this only works on Sears Homes that were mortgaged through Sears. Still, it’s an interesting way to find a Sears House! However, if you limited yourself to finding kit homes ONLY through mortgage documents (and grantee records), you’d miss about 75% of the kit homes in your community (based on some quick ciphering). 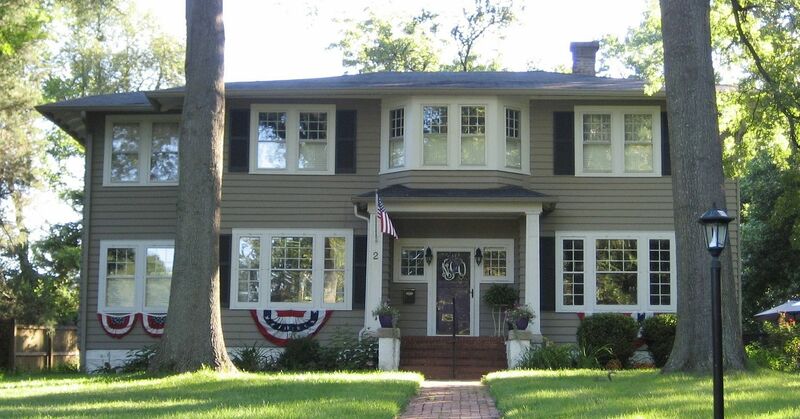 To read the other blogs on Webster Groves, click here, here or here. 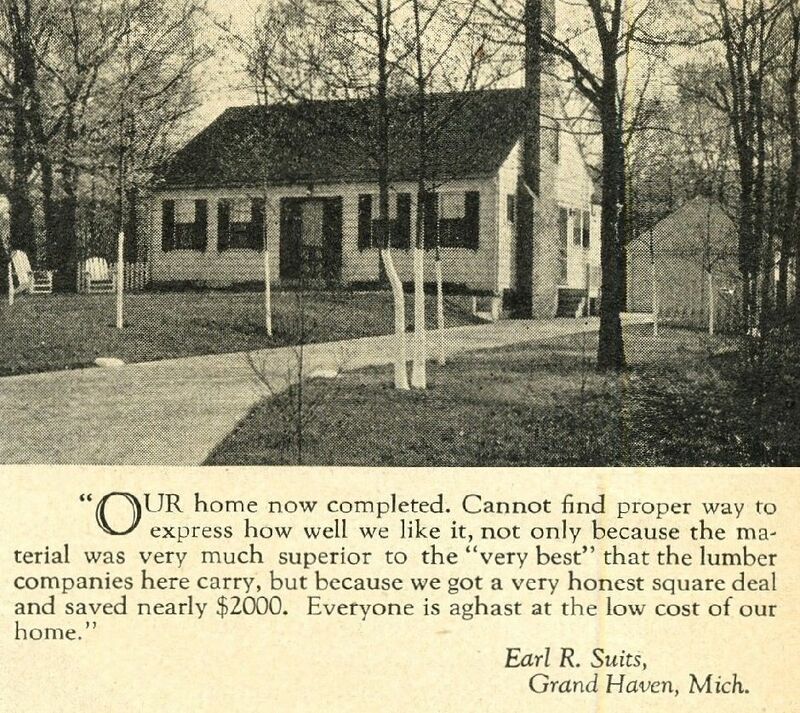 Sounds like Earl Suits was pretty pleased with his "Cape Cod" in Grand Haven (1938 catalog). 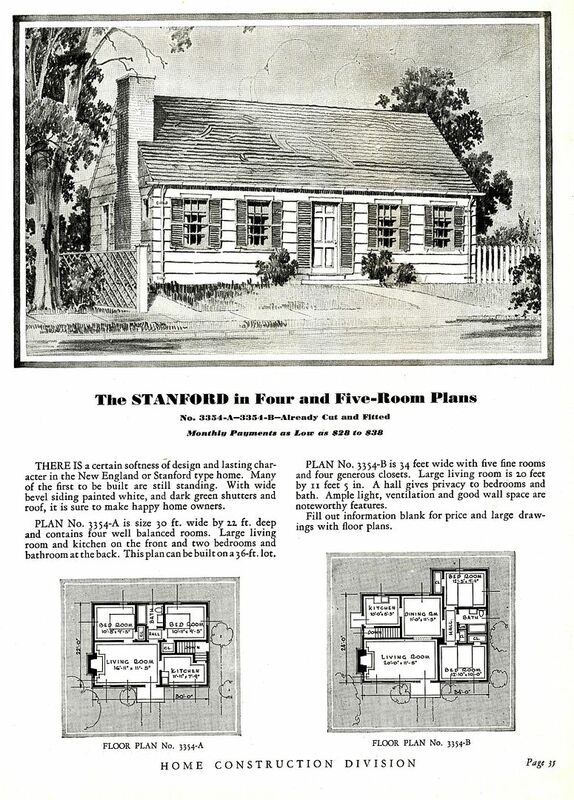 In the 1932 catalog, it was known as The Stanford. 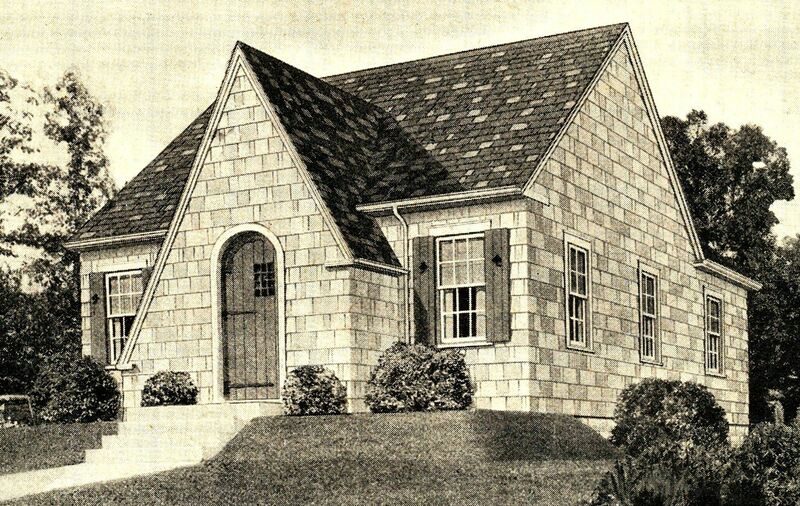 The 1938 catalog has it listed as "The Cape Cod." 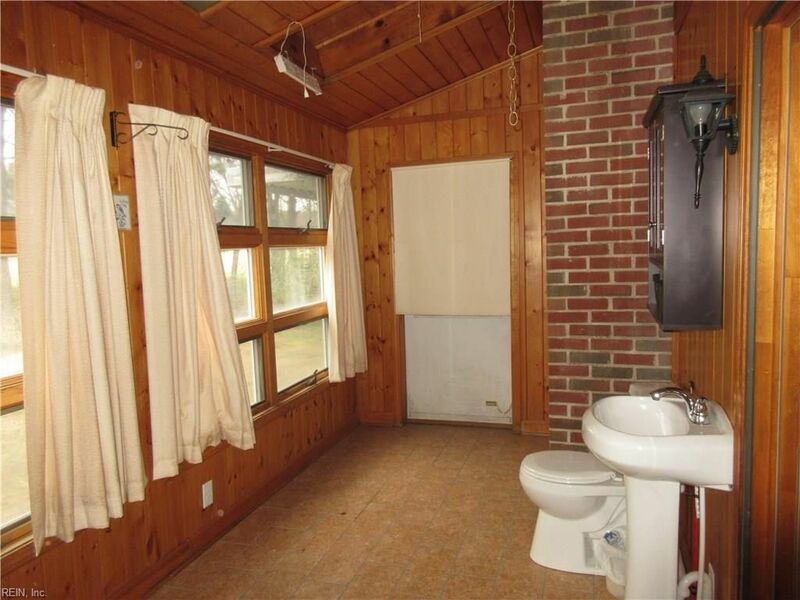 Throughout the years, it was offered in two floorplans. 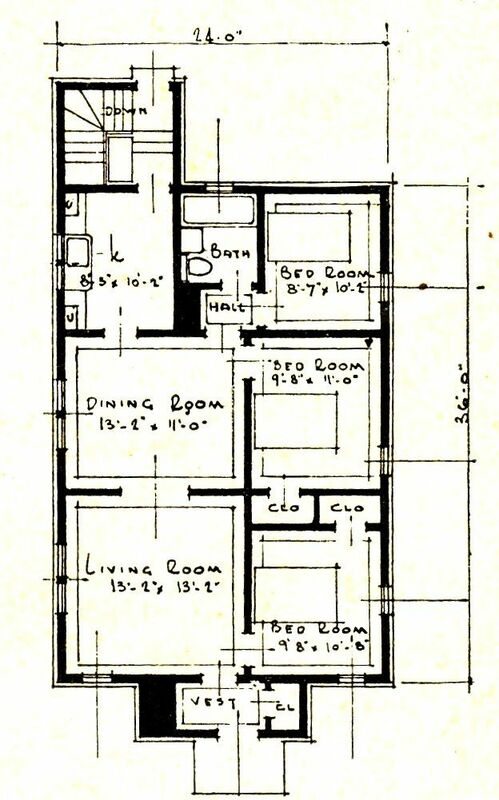 The smaller floorplan is a miserly 660 square feet with an tiny kitchen and two walk-in-closet-sized bedrooms (1938). 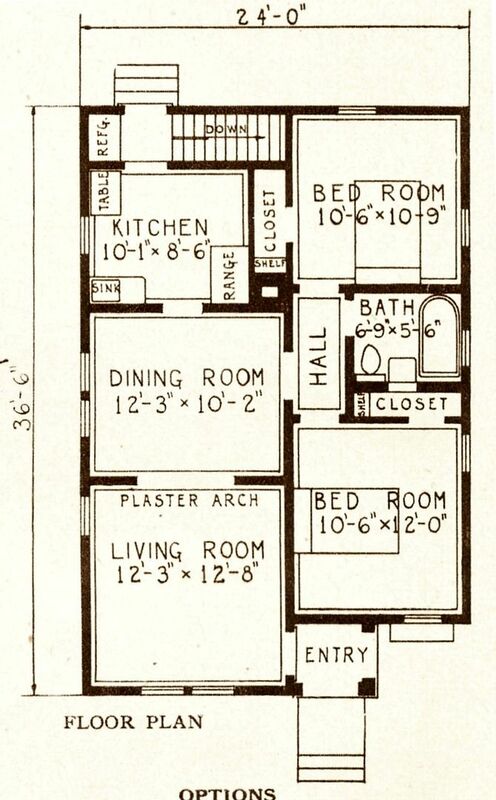 The second floorplan had a little more breathing room (and a dining room). 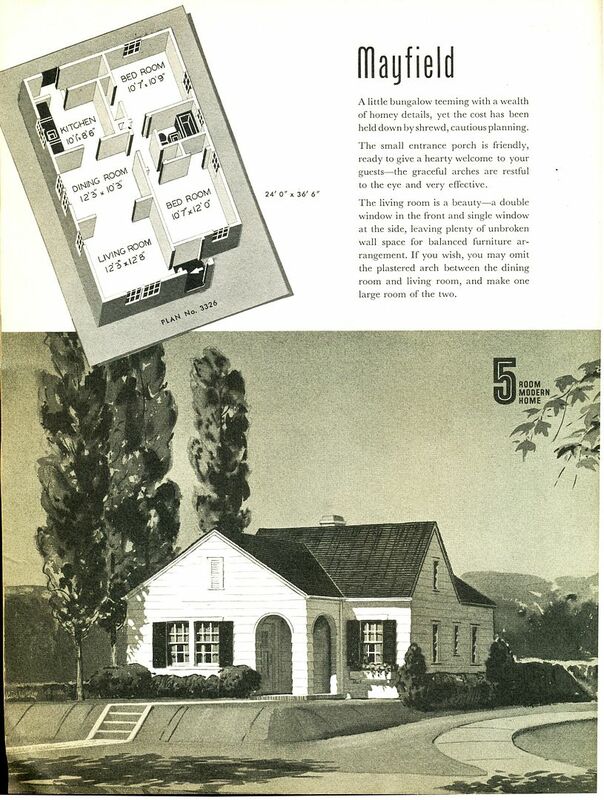 It is a fine house, replete with an "expandable" attic on the 2nd floor (1938 catalog). 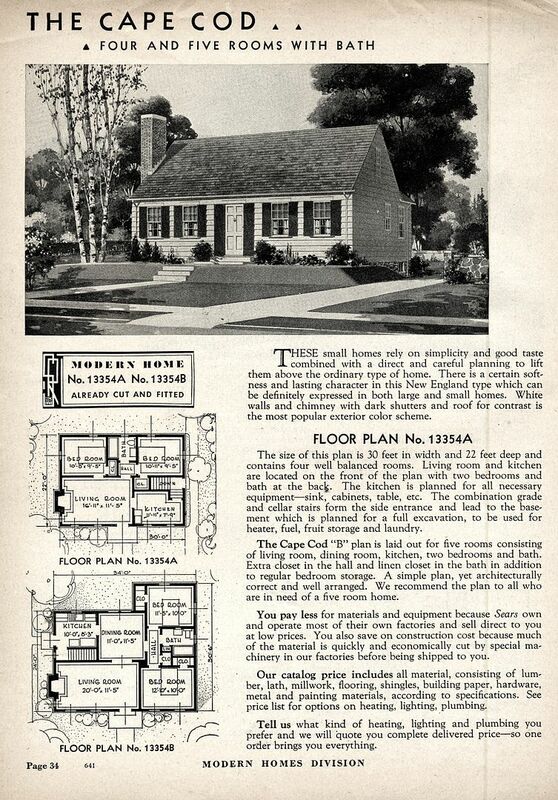 Those old wooden shutters (shown in the catalog image) added a nice touch to the Sears "Cape Cod." 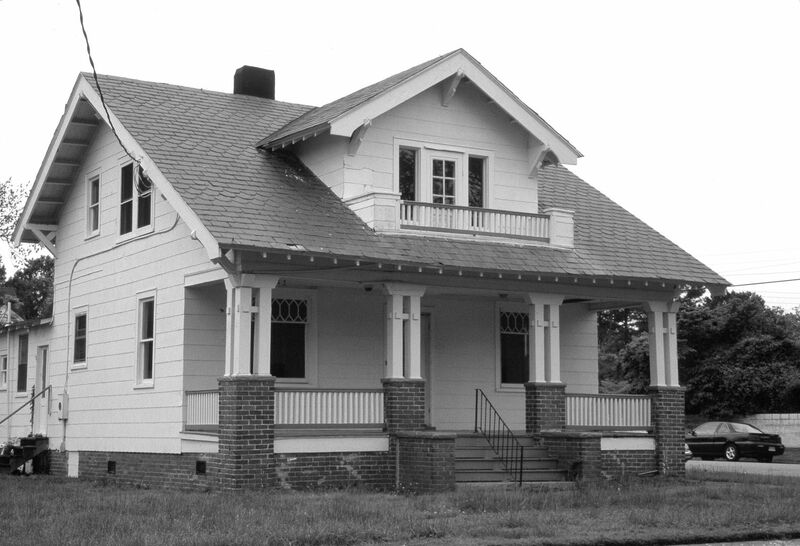 Notice that the attic window has been enlarged, and the dormers were added. Due to the intensity of the summer sun, this is a crummy photo, but you can see this is "Floor Plan B" with the dining room and larger footprint. I'd have to say that I probably would have driven right past this little house doing a traditional street survey. It's a fine home but it is rather plain and kind of disappears in a crowd. 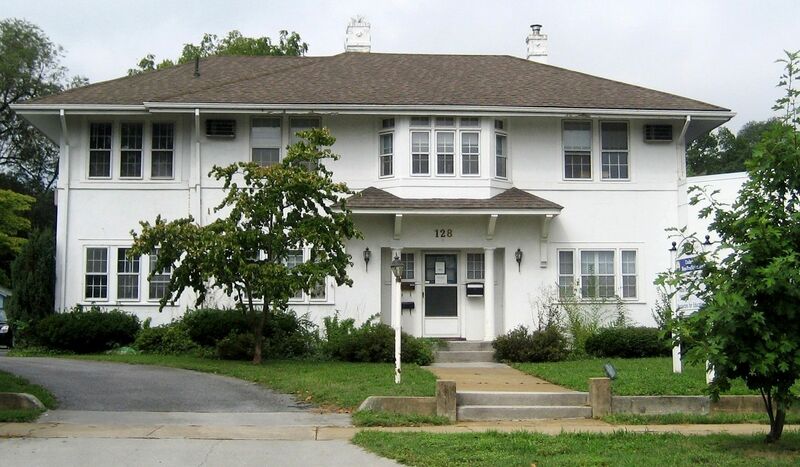 Here's another "impossible-to-recognize" Sears house. 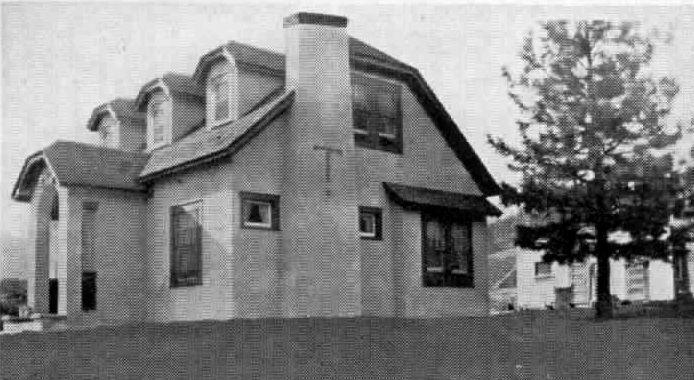 This doesn't match any of Sears 370 known designs, but it is a Sears House, customized by the home's original owner. 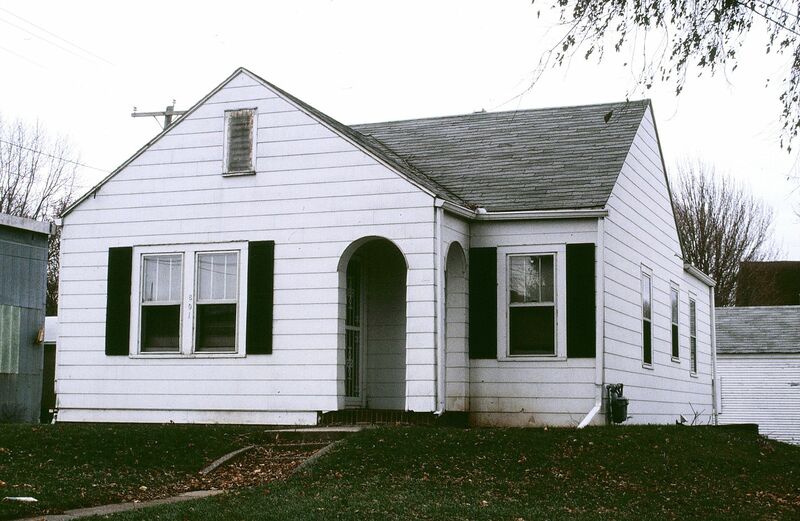 Rebecca Hunter found this house (in Elmhurst, Illinois) through grantee records. It's bonafide, but it's also a puzzler! Eighty Percent of the People Who Think They Have a Sears House Are Wrong. Yes, that’s a true fact. Back in the day, I actually kept track of such numbers, and back in the day, I found that about 80% of the people who thought they had a Sears kit home were wrong. Typically, these folks did in fact have a kit home, but it turned out to be a kit home from another company. I doubt that there’s an adult alive today that hasn’t heard of Sears and Roebuck, but how many people have heard of Gordon Van Tine, Aladdin, Sterling, Harris Brothers or Lewis Manufacturing? 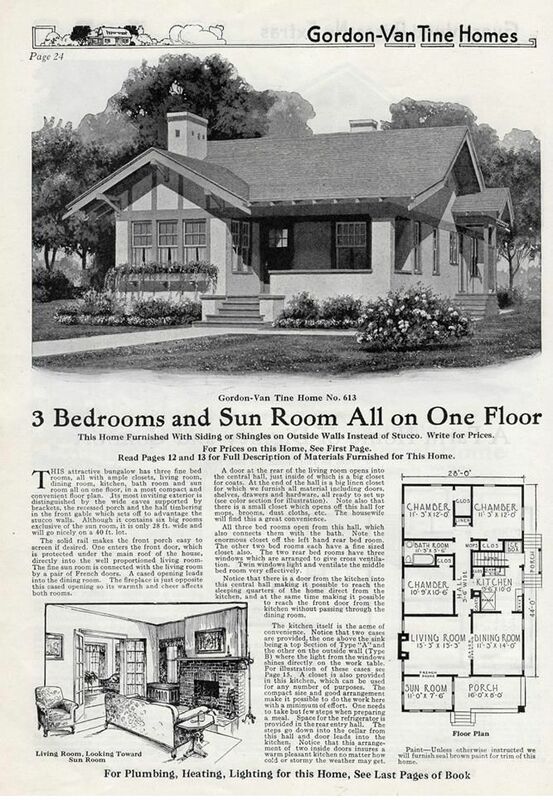 How many people know that Montgomery Ward sold kit homes in the early 1900s? So while the legend of a “kit house” might survive through the generations, the facts of the story often get confused. Which leads me to the topic of today’s blog. 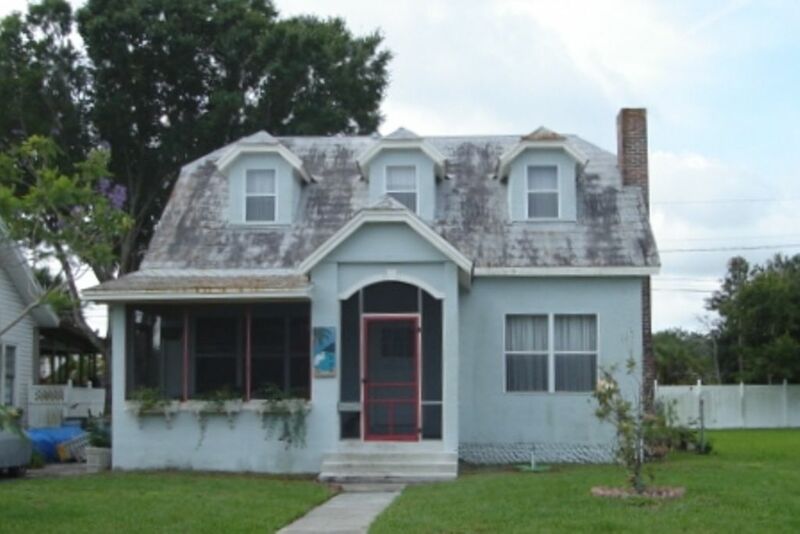 Last week, friend and indefatigable researcher Rachel Shoemaker discovered a blog about a “Sears House” in Melbourne, Florida. 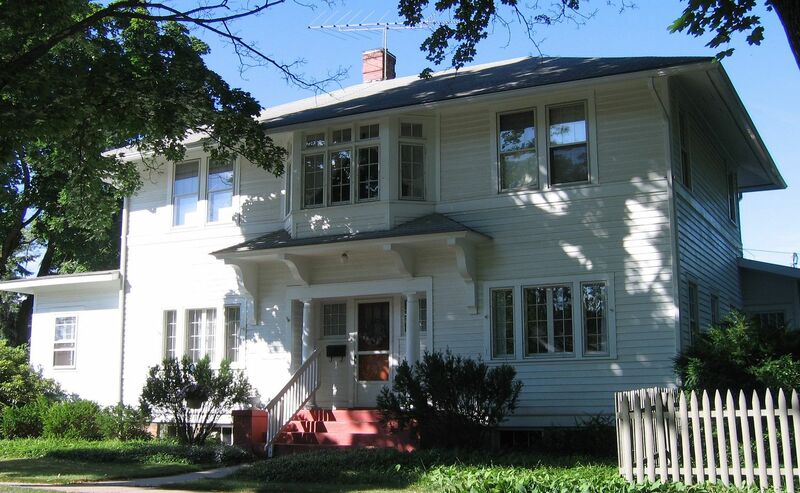 Rachel took one look at the house featured in the blog and realized, it was not a Sears House, but rather, a kit home sold by Gordon Van Tine. 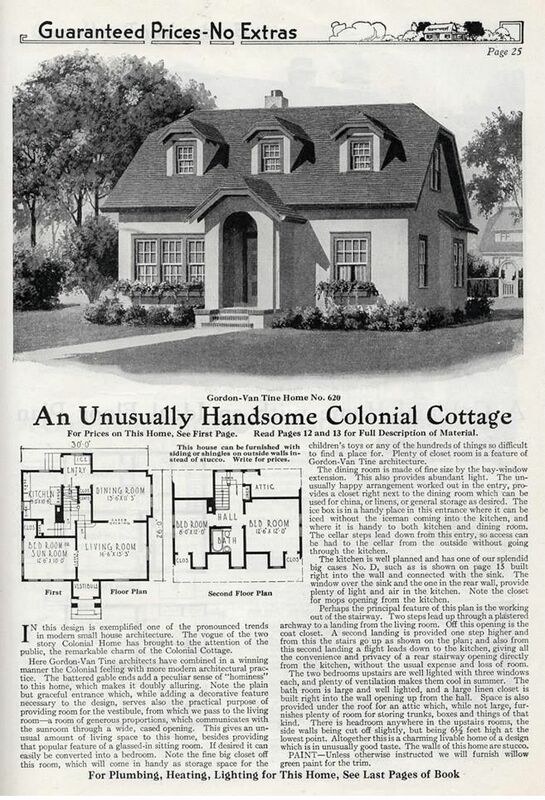 In the blog, the house in Melbourne is misidentified as a Sears Gordon, but (thanks to researchers Mark Hardin and Rachel Shoemaker), we now know that this is a physical impossibility. 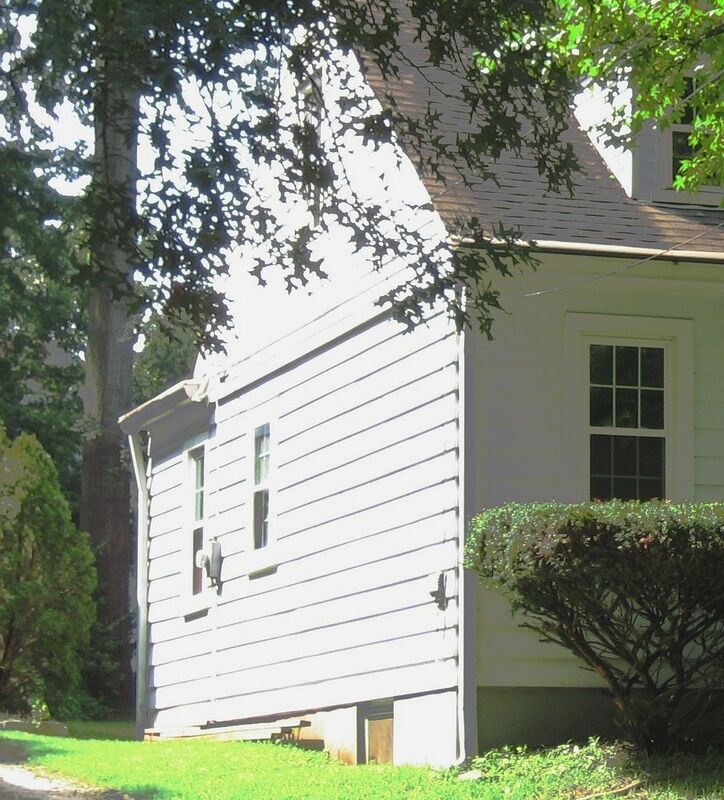 After doing some digging, Rachel and Mark found that the little Cape Cod style house was not only present, but occupied when the 1930 Census was conducted. 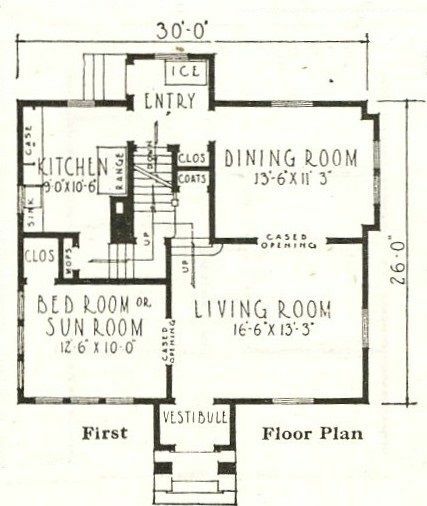 So this “Ready-Cut” house was already built and occupied in 1930. 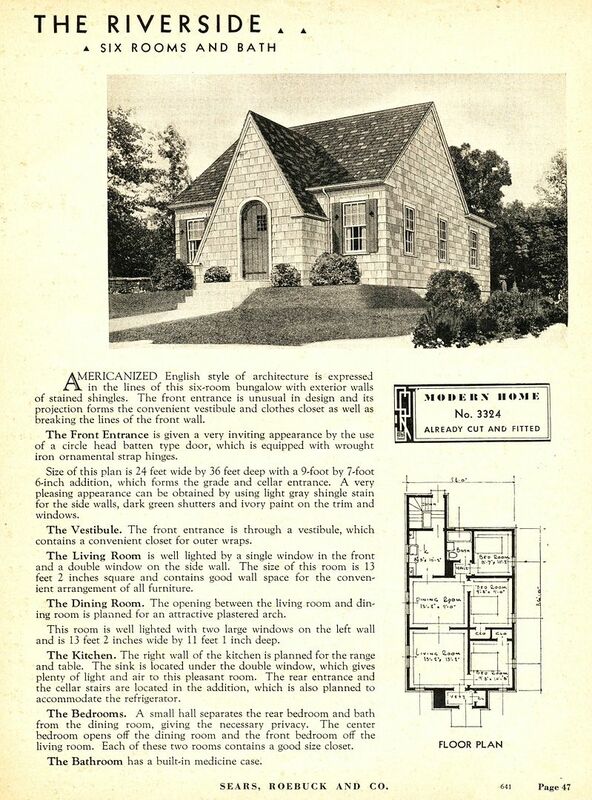 But the Sears Gordon did not appear in the Sears Modern Homes catalog until Spring 1931. 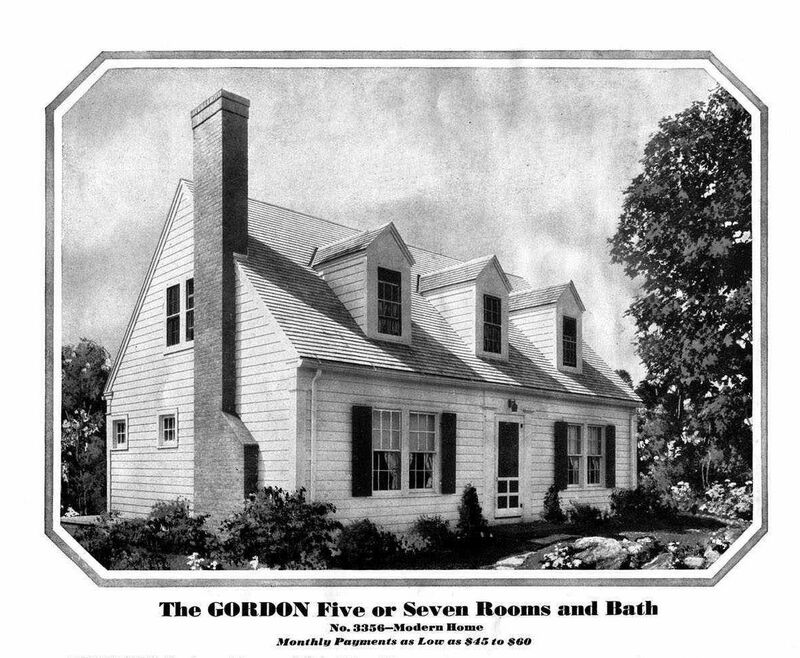 And then there’s the fact that the Sears Gordon really doesn’t look much like the little house in Melbourne. Again, this is a very common mistake. And there’s another piece to this story. Rachel, who’s quite adept at finding kit homes via Google Maps, found that to the left of the little Cape Cod is another Gordon Van Tine house (Model #530). And to the right is a Gordon Van Tine Model #613, with a Gordon Van Tine garage! There’s a story there, but what is it? 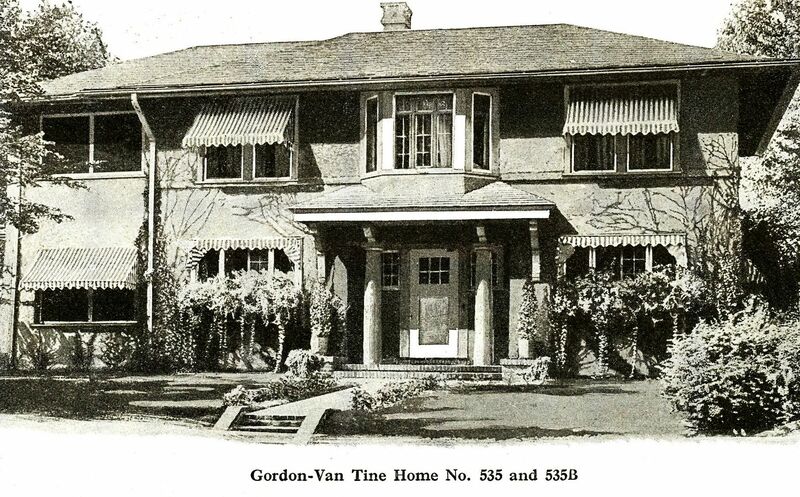 How did three Gordon Van Tine homes end up in one cluster? Based on my experience, it was probably a family enterprise. This was pretty common. If you have any information to the back story of these three Gordon Van Tine houses, please oh please leave a comment below! To read the original blog featuring this subject house, click here. To visit Rachel’s blog, click here. The auditor's website has a photo showing the little Cape Cod in Melbourne, pre-restoration. The catalog page for the GVT 620 (1927). Hmmm, it looks a lot like the house above! The Sears Gordon (which is what the above house is claimed to be), was not offered until 1931, and yet the little Cape Cod (shown in the photograph above) was occupied during the 1930 Census! A side by side comparison makes it clear! The house on the left is the Melbourne house and the house on the right is the Sears Gordon. Ooh, now that's a nice match! Why, those two houses look just alike! 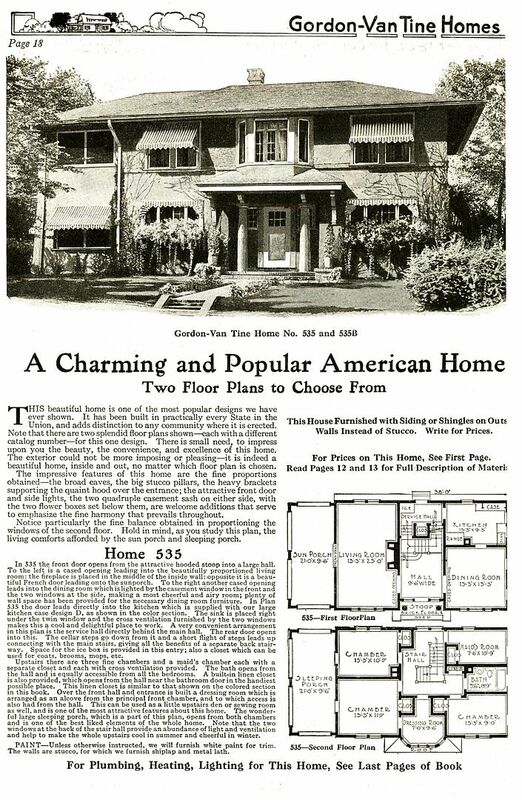 In 1927, Gordon Van Tine published a promotional catalog titled, "Proof of the Pudding," and in that catalog, it featured a Gordon Van Tine #620 (with the optional fireplace). If you compare this house with the house photos shown in the original blog link, you'll see it's a spot-on match! And just a couple weeks ago, I spotted a GVT #620 on an episode of "Undercover Boss." But wait, there's more! Rachel also found a GVT #530 next door to the GVT #620. The double dormers make this house easy to spot. Gordon Van Tine Model #530 sits to the immediate left of the house featured in the blog (GVT #620). Photo is from auditor's website. 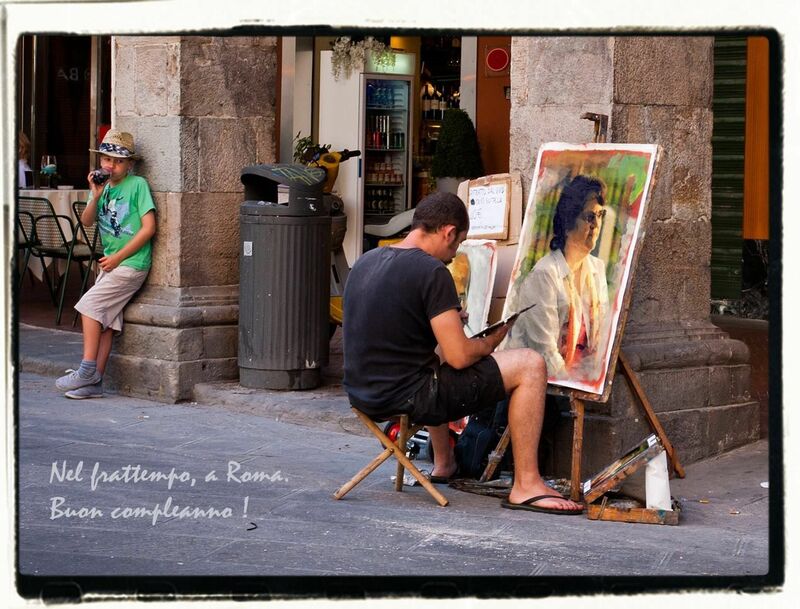 And she found a Gordon Van Tine #613 to the right of the GVT #620. So how did Palmetto Street in Melbourne end up with a Gordon Van Tine #613 (shown above), a number #530 (with the double dormers) and a #620 (with the triple dormers)? And why isn't there a house in this cluster with just ONE dormer? Photo is from auditor's website. 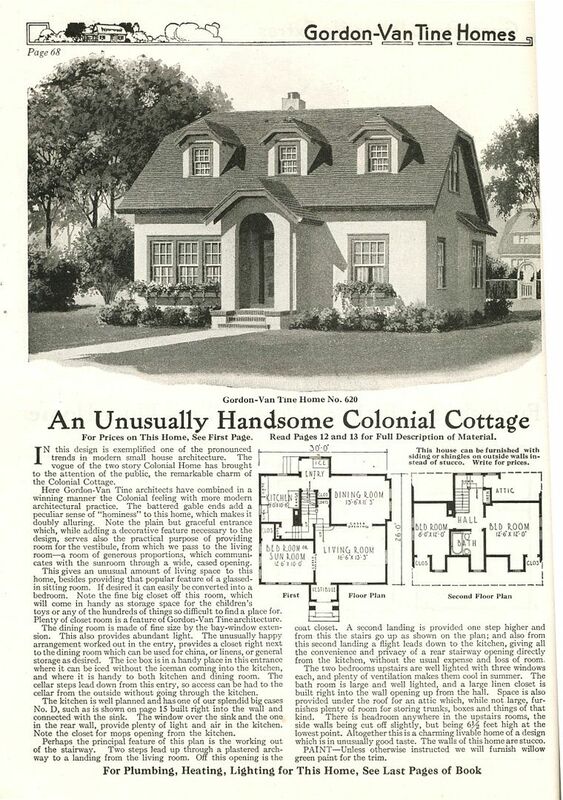 As mentioned above, misidentifying Sears Homes is a very common mistake. 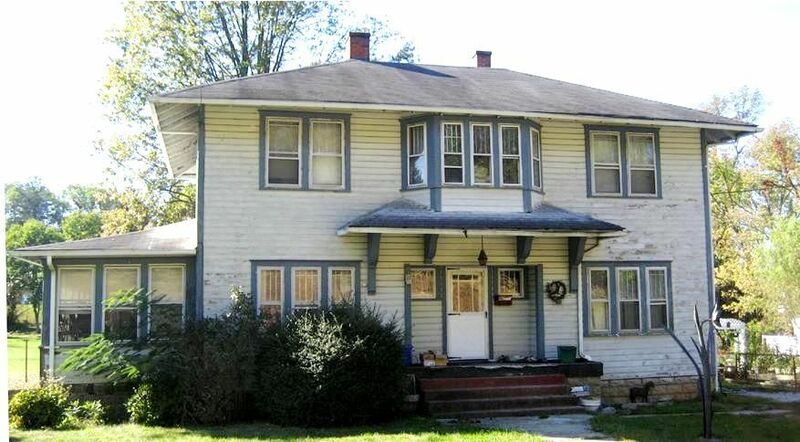 Last month in Staunton, Virginia, the owners of the home above were quite certain this was a Sears kit home. In fact, it turned out to be a kit home from Gordon Van Tine. And a lovely match, at that! The owners of that house in Staunton were THRILLED to learn the true facts about their house, and it’s my hope the owner of the GVT #620 will be equally thrilled to learn the true facts about her beloved home in Melbourne. Since 1981, I’ve worked for myself, owning a series of small businesses, some of which have been successful and some of which have not. 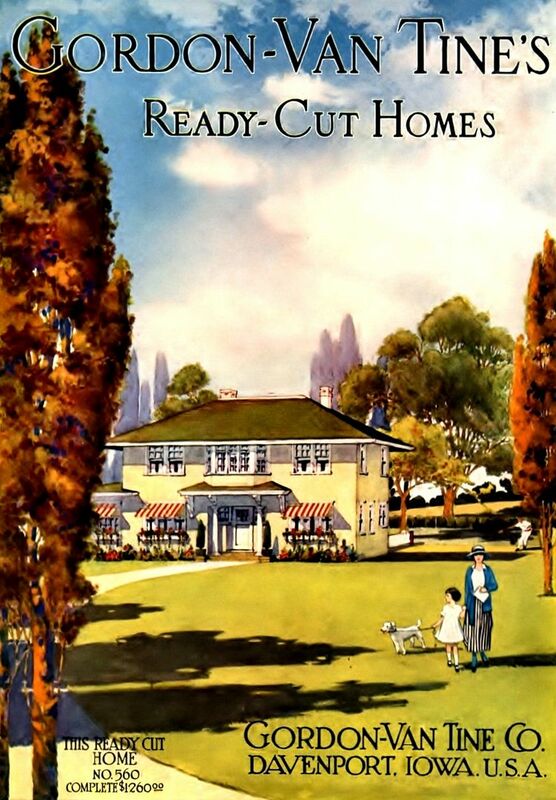 Currently, I only have one small business (”Gentle Beam Publications”) which publishes a handful of my own titles (such as “The Houses That Sears Built”). All of which goes to explain why my #1 favorite show on Prime-Time TV is Undercover Boss. 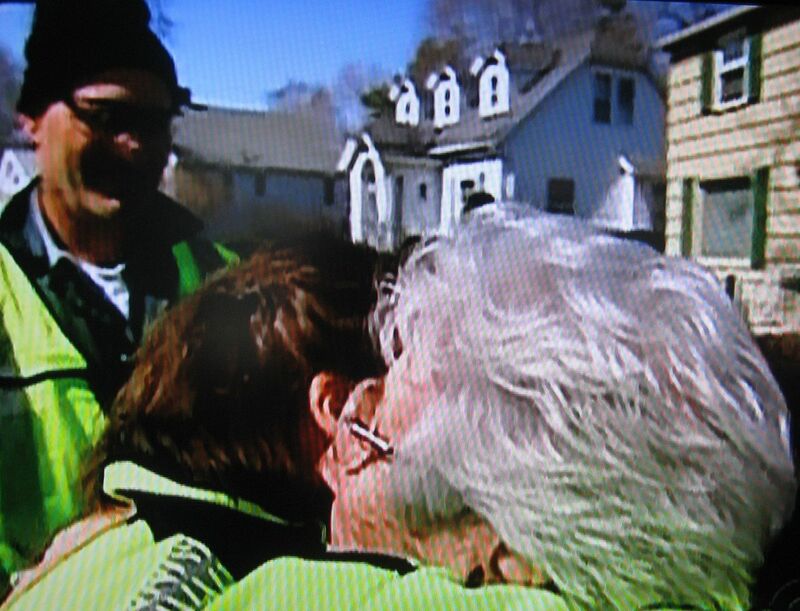 Thursday afternoon, I finally got around to watching an episode which aired sometime earlier in the month (episode: “Epic Employees”), when I saw a house in the background that caught my eye. I hit the pause button on the DVR and took a closer look. Next, I pulled out an old GVT catalog and thumbed through it, looking for the cute little house with the clipped gables and three dormers. Sure enough, I was right. 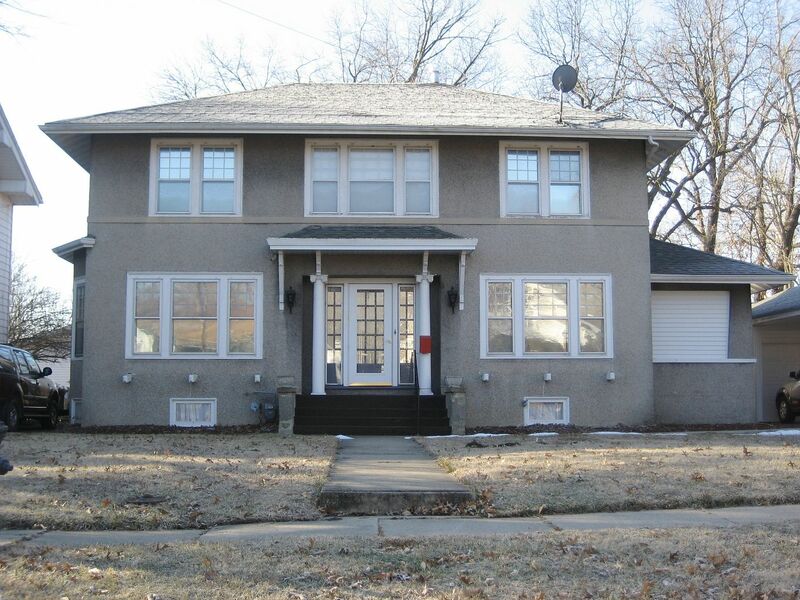 The house on Undercover Boss was a Gordon Van Tine kit home, Model #620. For several months, I’d been hoping to find this model, as I’ve never seen one, and there it was. On TELEVISION! Do you have a GVT Model #620 in your neighborhood? If so, please send me a photo! And please do tell me, what is it like to be able to watch TV without studying all the houses in the background? To read the next splendiferous blog, click here. The house shown in this scene from "Undercover Boss" is actually a kit home from Gordon Van Tine. What's it like to watch television without studying all the houses in the background? I do wonder about that sometimes. Strikes me as a little boring, actually! Close-up of the cute little house with the three dormers. 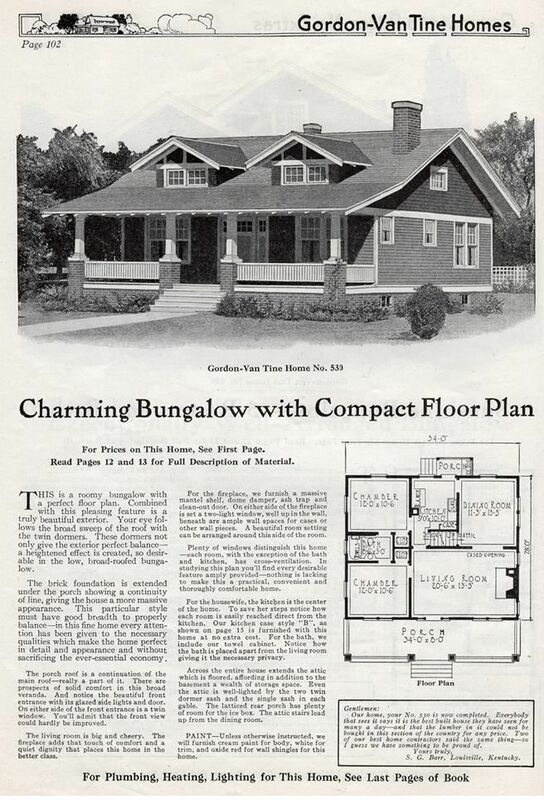 After seeing the house on television, I pulled up this image of GVT #620 (1927 catalog)! 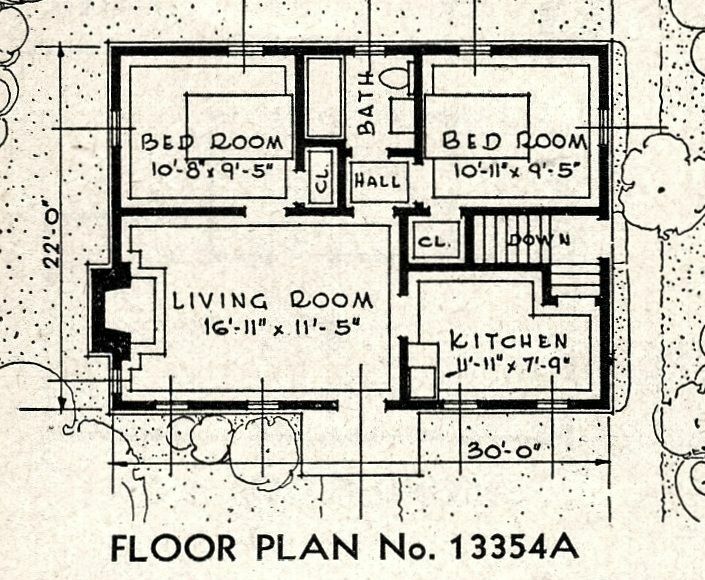 It was a darling little house with a good floor plan. Note the three windows on the one side and the bay window on the side. No doubt, it's the GVT #620 in the background. 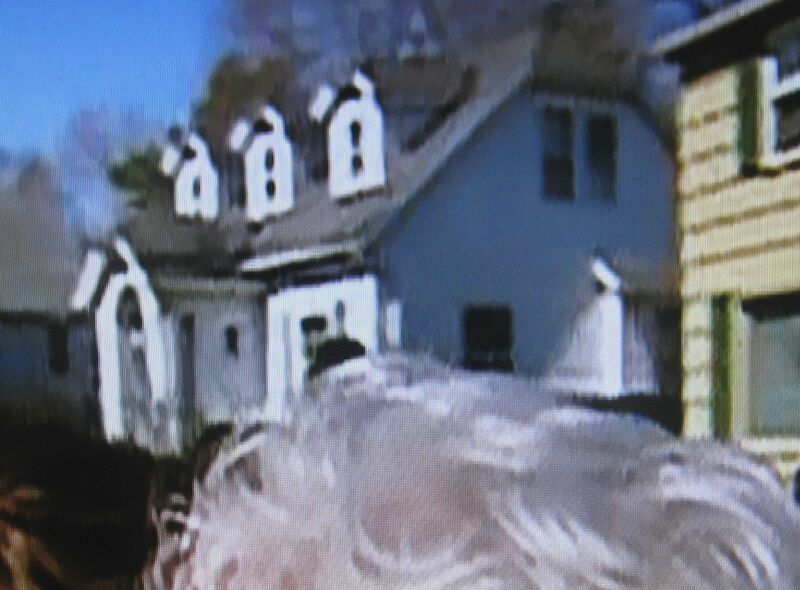 If you look close, you'll see the edge of the bay window with a shed dormer (just above the gray hair). What a fine little house! 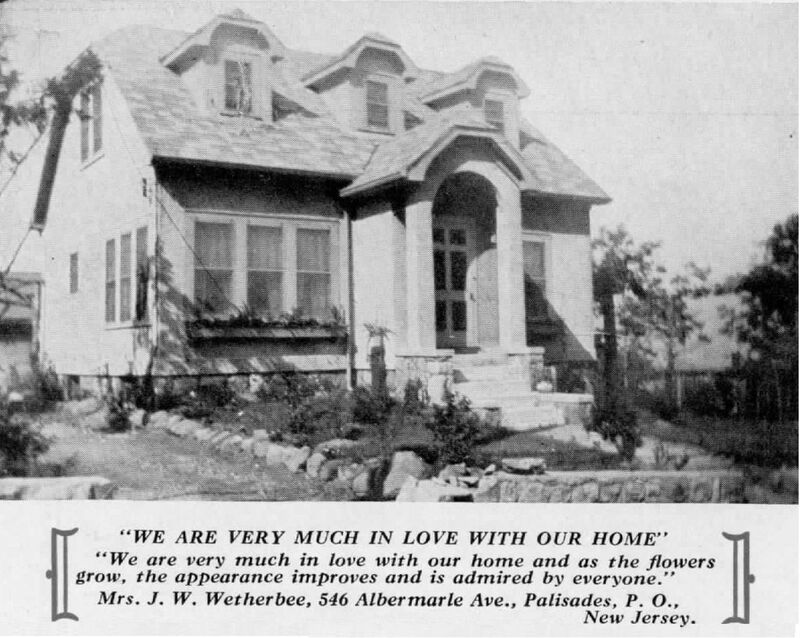 According to the 1927 testimonial booklet (GVT's "Proof of the Pudding"), there's a #620 in Palisades, NJ. And in this testimonial, they even give us an address! And here's another GVT 620. This one is in Peshastin, Washington. The #620 in Peshastin was built by F. H. Tompkins. Do you live near Peshastin or Palisades? If so, I’d love a photo! The Sears Berwyn (named for a city in Northern Illinois) was one of their most popular houses, and it’s a cutie-pie of a house, too! 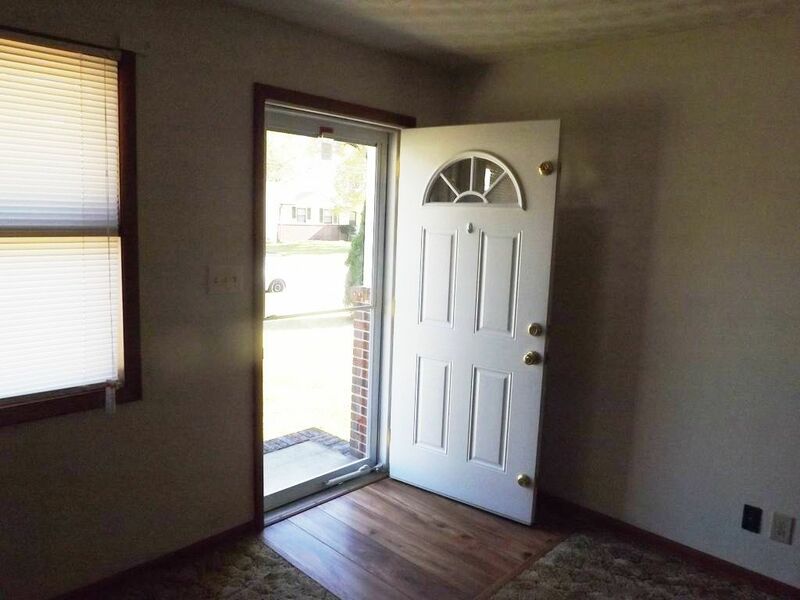 The double-arched front porch makes it easy to identify. 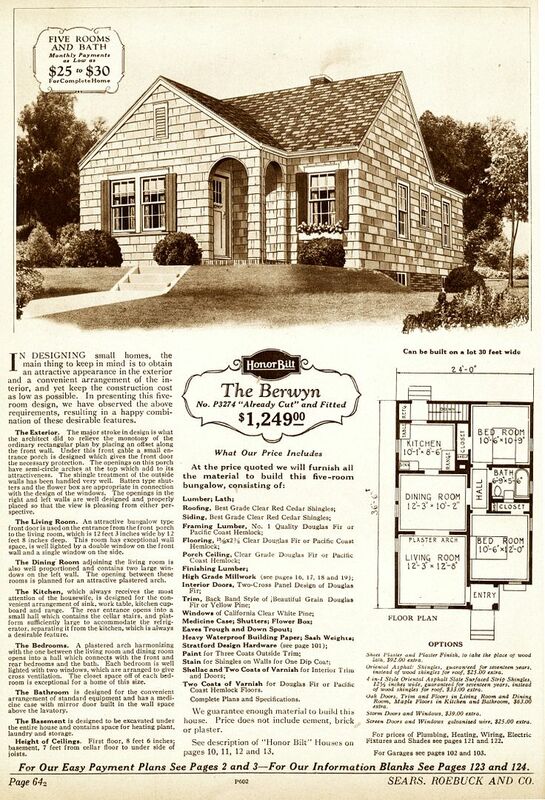 The Berwyn as seen in the 1929 catalog. 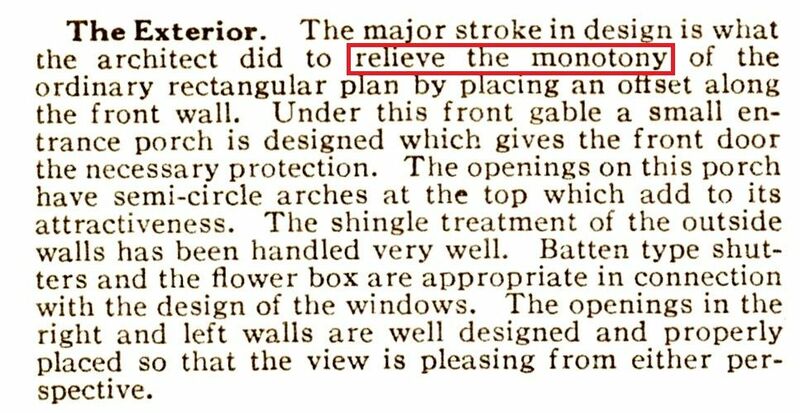 The text in the 1929 catalog promises that monotony is relieved in the Berwyn. 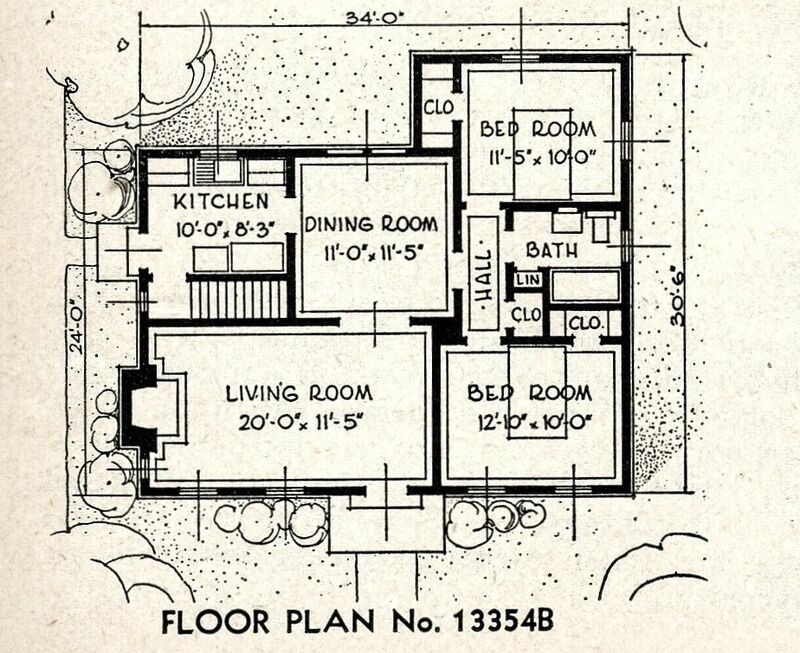 Small house, but thoughtful floor plan. 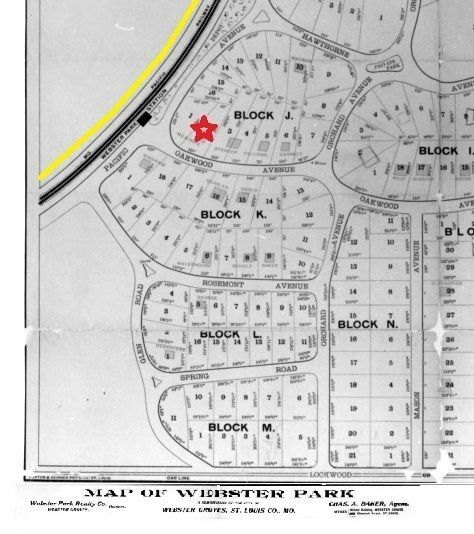 By 1938, the Berwyn hadn't changed much, but it had a new name. This long thin vent on the front gable is a distinctive feature on the Berwyn. 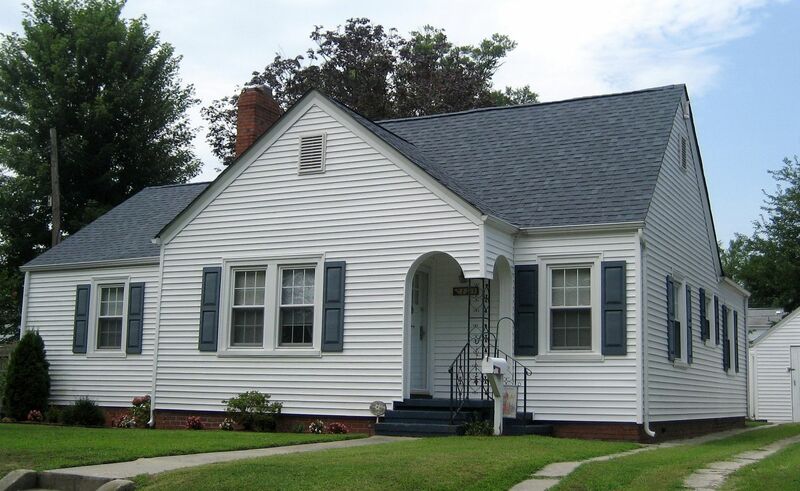 The cement-based siding was probably added in the 1950s. 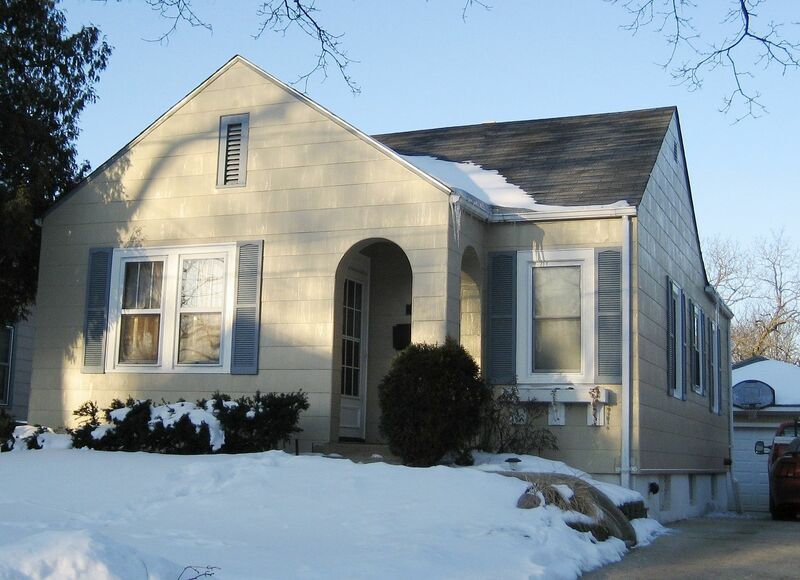 This snowy house is in Elgin, IL. This Berwyne is in Kirkwood, MO and some not-so-thoughtful vinyl siding installing wreaked havoc with that double-arched opening. 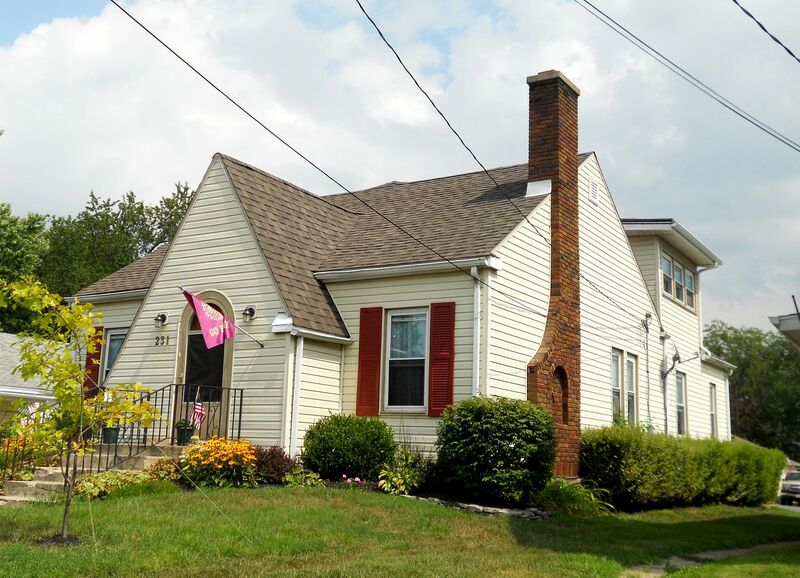 Another Berwyn with the cement-based siding (White Sulphur Springs, VA). This house in Rock Falls, Missouri is clad in aluminum siding. And this Berwyn is in my neck of the woods, Hampton, Virginia. The wrought-iron post is not a good idea. 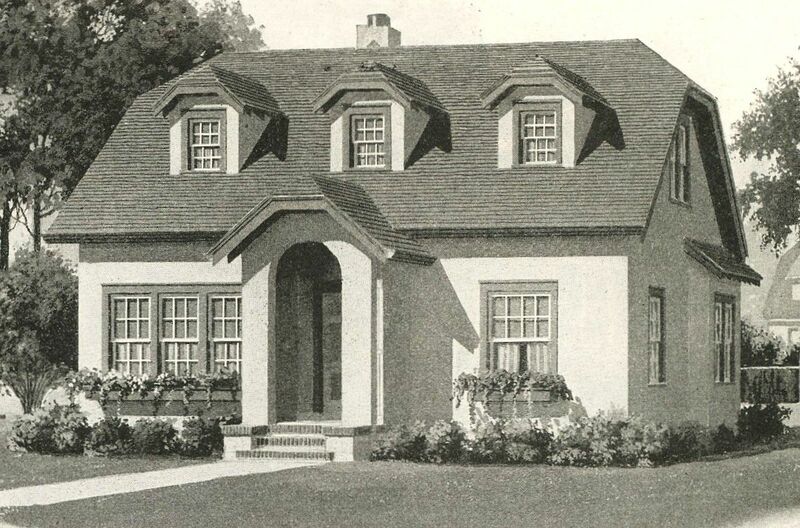 The Berwyn was one of a handful of houses that made it into the very last Sears Modern Homes catalog (1940). In this catalog, it was renamed the Mayfield. To read about Teddy the Wonder Dog, click here. I didn’t have a clue, so I dug out the old catalogs and studied the two models. And then I learned something new. The Sears Riverside and the Sears Claremont are the same house - down to the details. 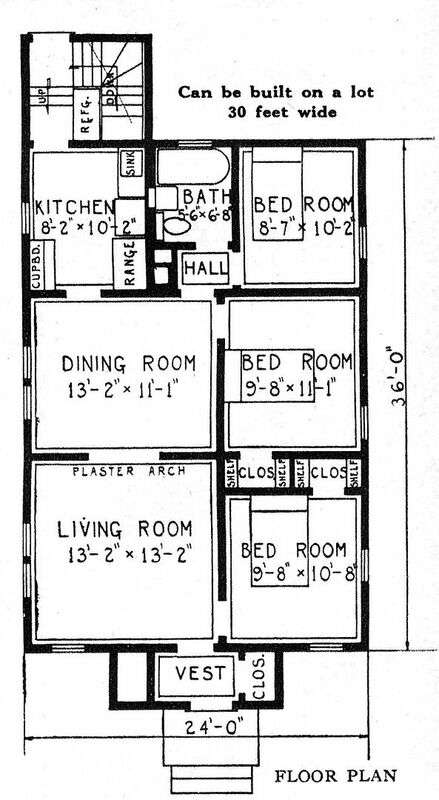 The floor plans are identical, as are the room dimensions. 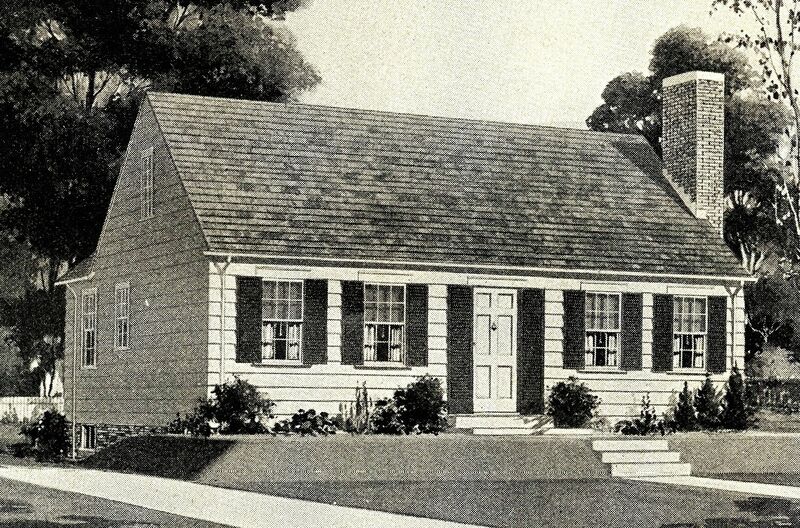 Why did Sears use two different names on one house design? Just to confuse us 70+ years later, I suppose. 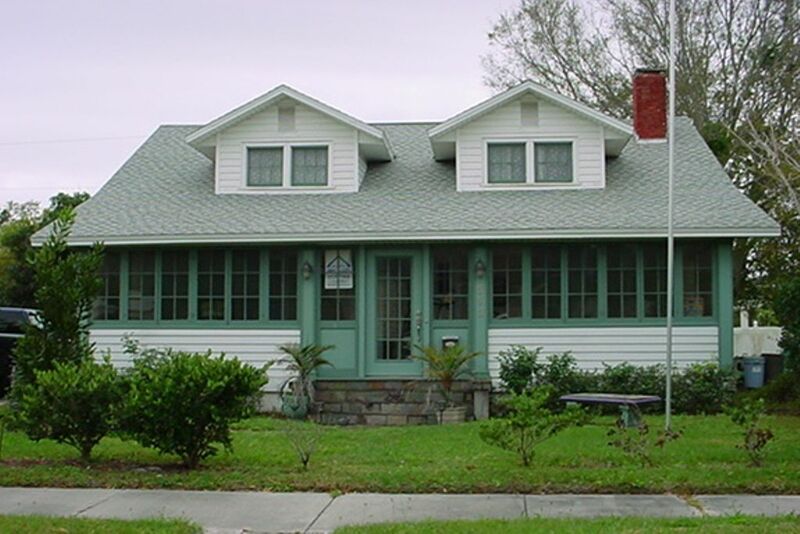 In the late 1920s, this little Cape Cod was known as The Claremont. Sometime in the early 1930s, it was renamed The Riverside. 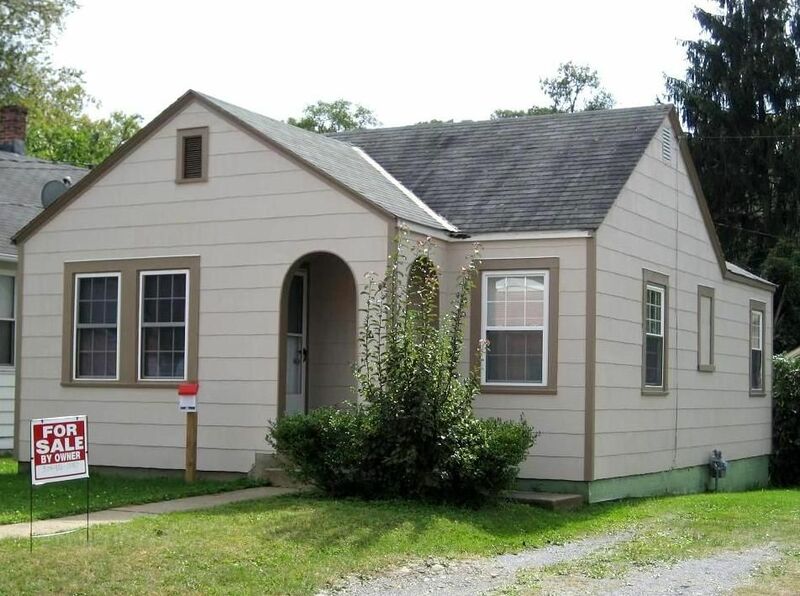 Cindy found this house by searching old mortgage records. 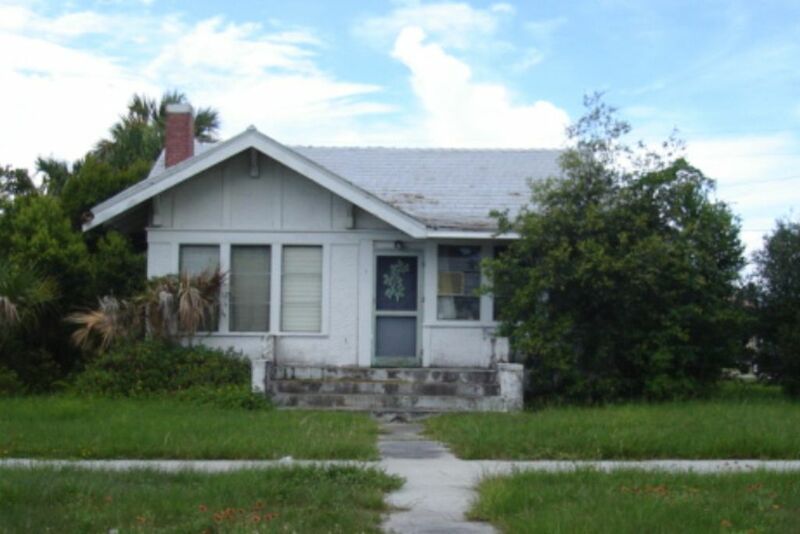 According to her research, the house was built in 1929, and the original mortgage amount was $4,600. 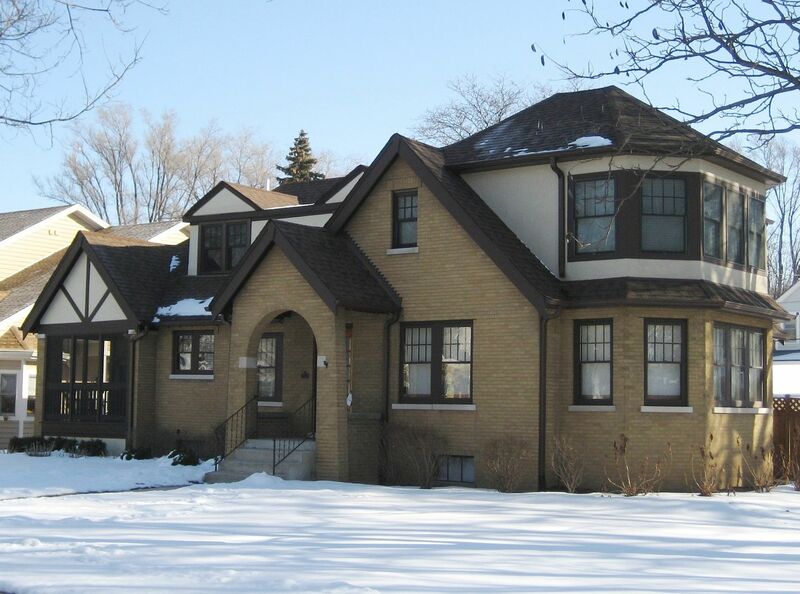 To see pictures of the big fancy Sears Houses, click here. 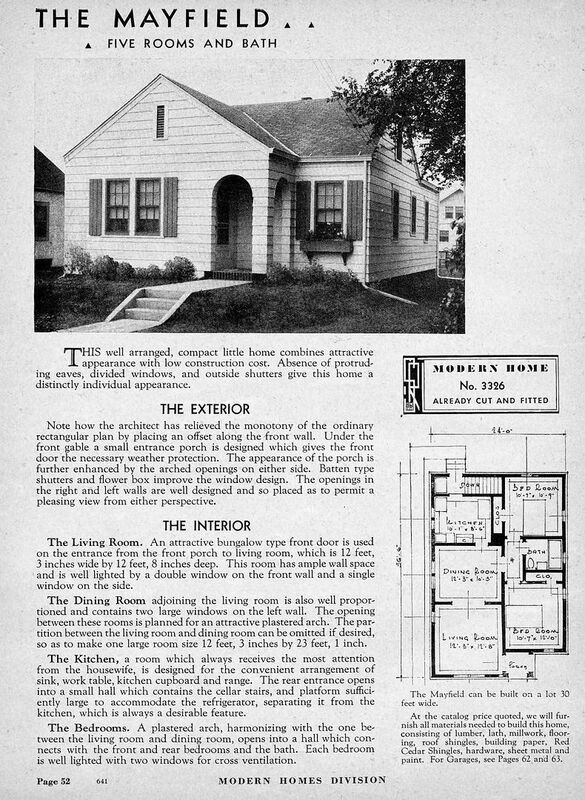 The Sears Riverside, as seen in the 1934 Sears Modern Homes catalog. 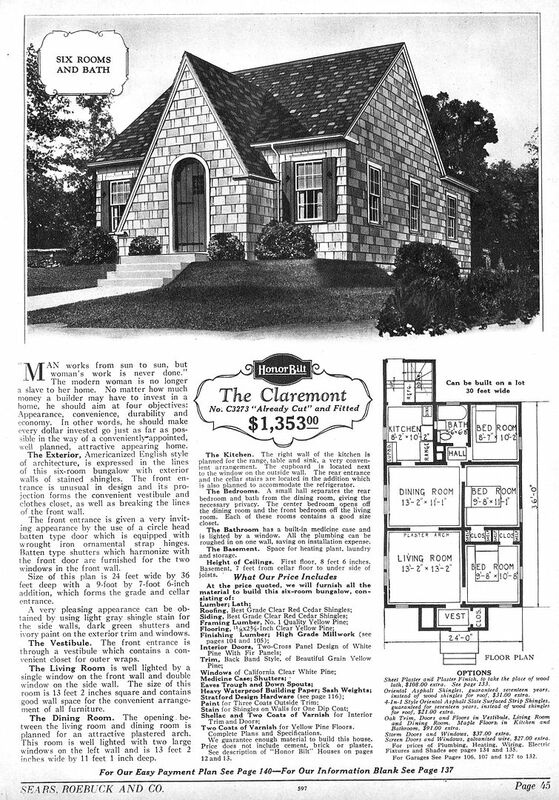 The Sears Claremont appeared in the 1928 catalog. Not much difference between the two houses! The Claremont (1928) is on the right, and the Riverside is on the right. Why, they even have the same bushes in the front!! The Riverside was 24' by 36'. And so was the Claremont. So, the Riverside/Claremont (Rivermont?) was the same model with two names (1928 and 1934). And, best of all, it was a very attractive Cape Cod. 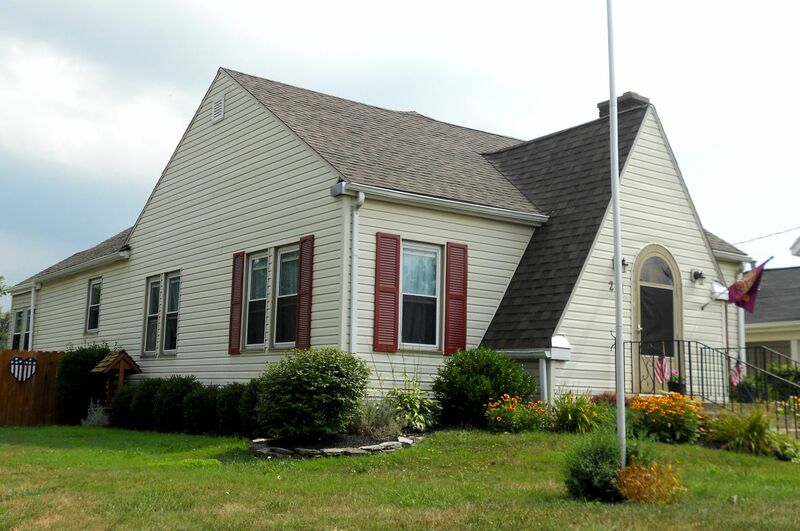 To read about the other kit houses in Mechanicsburg, click here.